A new fiber-laser-cutting machine and material storage/handling unit enable Decimal Engineering to replace as well as complement some stamping operations. Riding the leading edge of technology is not for the faint of heart. It requires investment in equipment and in the human capital to ensure that it runs effectively, productively and profitably. And it demands forward thinking to recognize trends in markets, processes and business cycles. Leading-edge manufacturing also demands flexibility and diversity in order to adapt quickly in our ever-changing manufacturing world. When the ride works, a manufacturer can achieve and maintain growth, thus enabling the ride to continue. MetalForming recently visited such a company, Decimal Engineering in Pompano Beach, FL. Through its 51 years, Decimal has grown from a small sheetmetal job shop to a full-service manufacturer, providing parts and subassemblies to aerospace, defense, telecom, aftermarket-automotive, general electronics, medical and marine markets. The company’s expansive list of capabilities includes CNC machining, laser cutting and other fabrication, metal stamping, and even 3D printing of prototypes, jigs and fixtures. Its strong engineering team can deliver prototypes from concepts within one to four weeks, part of the company’s goal to deliver all aspects of a customer project from beginning to end. An ERP system ties into Decimal’s production equipment, including the new laser-cutting cell, to allow paperless workflow control. Efforts to capitalize on automation and technology find their roots in the 1980 purchase of the company’s 4000-sq.-ft. operation, then located in nearby Fort Lauderdale, by Arthur and Priscilla Garey. They soon began to modernize, buying automated equipment and bumping up required manufacturing space to where the company had to move to larger facilities in Pompano Beach. Today, Decimal occupies 50,000 sq. ft. with 100 employees working across multiple shifts. Still growing—in the past few years its sales have increased 12 percent annually—and still assessing the latest and greatest, Decimal management walked the aisles at FABTECH 2017 in Chicago. That’s where we learned from Kevin Garey, Decimal’s vice president of operations, of the recent purchase of a Bystronic 6000-W fiber-laser machine along with an Antil 22-shelf material-storage/handling tower unit. Kevin and his brother Alan, CEO and president, (Alan and Kevin are Arthur and Priscilla’s sons) later would provide a tour of Decimal and explain how the fiber-laser acquisition grew out of the company’s growth on the stamping side. Having always been active in metal stamping, today, “we can take a customer from the design phase through prototypes and through short-run to high-volume stamping of 1 to 2 million parts per year,” Alan says, noting that inhouse slideforming- and progressive-tool capability supplies tooling for internal and external customers and provides the flexibility to try out new technologies. Decimal’s high-volume capability came courtesy of a stamping-house acquisition five years back, resulting in takeover of a wealth of tooling and machinery. Now in its 51st year, Decimal Engineering provides parts and subassemblies of varying materials for aerospace, defense and other markets. This exercise resulted in improved tooling, as converting 2D drawings to 3D models revealed interference issues and design flaws. With all of this data, Decimal created new tool designs and new, sophisticated tools that often succeeded from the first hit. Alan cites one example, a trigger part for a firearm. Using CAD upfront, Decimal created a new, complex 25-station progressive die that performed well from the start. While converting tool and part designs, Decimal also took on the acquired press-line equipment, updating it with new feeds, lubrication systems, controls and safety components. With its existing and refurbished lines, Decimal stamps aluminum, steel, brass and copper coils and blanks in various thicknesses, from 0.005 to 1/8 in. 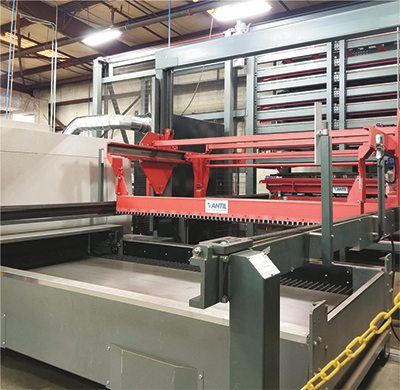 In its ongoing effort to handle entire projects for its customers, and against the backdrop of increased stamping operations, in late-2016 Decimal opted for the Bystronic BySprint fiber-laser-cutting machine with a 5 by 10-ft. cutting table, augmenting its existing laser cutter, a 2500-W CO2 machine. Antil Robotics and Automation provided the material-handling equipment as well as integration. 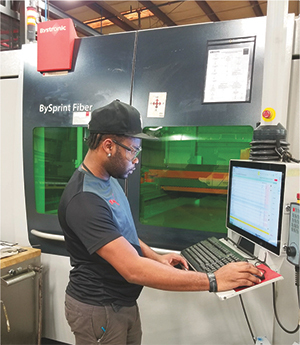 The BySprint provides high-volume part production and high cutting quality for thin to medium-thick ferrous and nonferrous sheetmetal, according to Bystronic officials, who note its low operating cost due to minimal energy requirements and no requirement for laser gas. 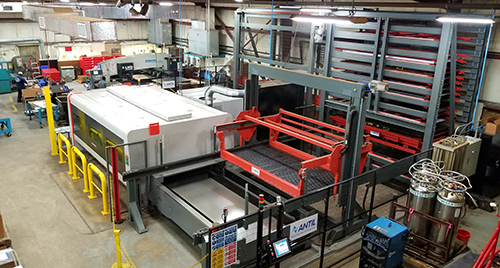 The Antil automated tower warehouse enables the laser-cutting machine to run lights-out, and its compact design fit snugly adjacent to the Bystronic equipment on Decimal’s shop floor. “The new fiber-laser machine and tower unit weren’t just needs, they were necessities in order to survive in this business,” explains Alan Garey, Decimal Engineering CEO and president. “We need to be on the cutting edge of technology, and this machine brings faster cutting capability inhouse." In addition, not only can Decimal perform laser blanking and slitting on material destined for stamping operations, but the company has transferred loads of work from its presses to the new laser cutter. 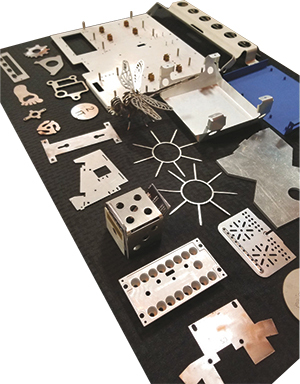 Again, positioning itself as a full-project answer for customers, and with fiber-laser cutting as part of that equation, Decimal has made the most of its vast capabilities range. With so many machines, processes and jobs, Decimal relies on the Made2Manage ERP system from Aptean, Alpharetta, GA, to keep materials, machine availability and job routing straight. Providing scheduling from project beginning to end, the ERP system allows paperless workflow for Decimal–a timesaver that optimizes shop-floor productivity and materials management, according to Kevin.